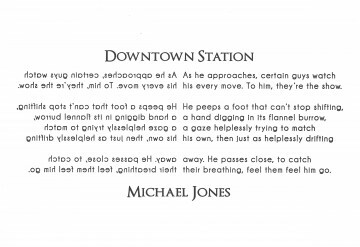 Michael Jones teaches at Oakland High School in Oakland, CA. His work appears in Atlanta Review, Beloit Poetry Journal, and other places. Places have a rhythm all their own, sometimes subtle like the growing season on a farm, sometimes blatant like the workday rush of a downtown train station. Jones makes the crush of the crowd palpable in all those iambic feet galloping along (“He peeps a foot that can’t stop shifting”) with only the occasional jostle of another pattern (“To him, they’re the show”). The pattern of end rhyme is contrapuntal, city music at its best. The kind of song you don’t need to be able to name, just feel, like you would a passing stranger. The “he” in this poem is really enjoying being watched by the “they.” It’s almost as if “their” faces are his mirror, hence the doubled, reversed arrangement for the poem’s body. All this see-and-be-seen suggests a Jazz Age party, and Champagne & Limousines, while a new typeface, is styled after that era. The complimentary typeface had to be a little more severe, suggest signage outside the station while still retaining a hint of C&L’s roundness. Optimus Princeps has similarly wide bowls but also severe serifs and verticals just right for a signpost.